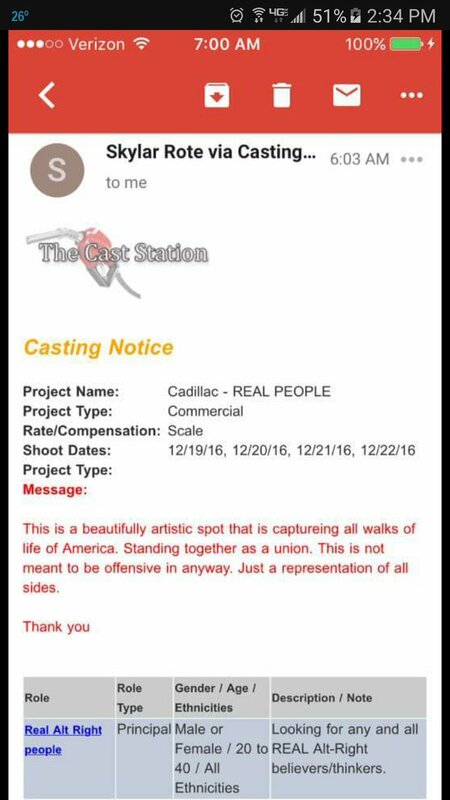 General Motors was under fire this weekend after a casting call sought members of the controversial alt-right movement for a Cadillac commercial. The alt-right, or alternative right, is an extremist movement that seeks a whites-only state. But even that statement garnered dozens of negative comments on Cadillac’s Facebook page. @BroderickGreer @Cadillac and good luck finding "alt-right" people of "all ethnicities"
The Cast Station, a TV and film commercial casting company that seeks actors in several major cities, said on Facebook that the casting call was a mistake. A key figure in the alt-right movement is Stephen K. Bannon, President-elect Donald Trump’s chief strategist and senior adviser in the White House. Bannon was the executive chair of Breitbart News, a website popular with alt-right supporters. Members of the alt-right said the movement was buoyed by Trump’s candidacy and election. In August, Rocky Suhayda, a top American Nazi Party leader, said a Trump victory is “going to be a real opportunity for people like white nationalists,” according to The Washington Post. And David Duke, the former Ku Klux Klan leader, who ran unsuccessfully for the U.S. Senate in Louisiana, tweeted “God Bless WikiLeaks” shortly after Trump won the presidential election. ‘Go back to Africa’? This man will — if racists pay his way.